"Alter Markt" means "old market" and this is exactly what it is: the old market square of Salzburg, just between the Getreidegasse and the Salzburger Dom. It was built in 1280 and unites a number of attractions. The "Fürsterzbischöfliche Apotheke", the former court pharmacy, stands out with a beautiful Rococo façade, the chocolatier "Fürst" has its main shop here. Fürst is the inventor of the Mozartkugel and you can still purchase the originals here. The Mozartkugeln (or: "Mozart Balls") are still handmade, handwrapped and handsold for an exorbitant price. Look also for the Café Tomaselli, which is considered to be one of the most "Viennese" cafés of Austria, despite of not being in Vienna. Most visitors of Salzburg cross the Alter Markt on the way to Mozartplatz Square or coming from the Linzergasse area crossing Staatsbrücke - and most of them will probably enjoy the busy spot with its souvenir stores. However, most people walk by the house No. 10a without noticing it - it is the smallest house of Salzburg. Look at it. Laugh at it. Take a picture. A more prominent building is the "Altes Rathaus" that was briefly mentioned in the article about the Getreidegasse - it is located by the "Kranzlmarkt", a separate part of the old market square. It is a building from 1407 with a tower; is now has a Rococo façade from 1772, including a moon dial and a marble statue of Justitia. Right next to it you will see the oldest patrician′s house of Salzburg at Kranzlmarkt No. 3. 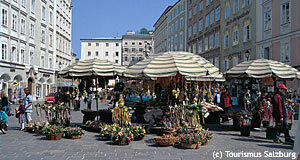 The Alter markt belongs to the most exclusive shopping areas of Salzburg.